Photo of the cast of ‘The Comedy of Errors’ by Scott Suchman. With the addition of several rollicking musical numbers and a very Greek setting, Shakespeare Theatre Company makes the hilarity of “The Comedy of Errors” accessible to all. “The Comedy of Errors” is an amalgamation of the very best farcical tropes; puns, slapstick humor, and mistaken identities abound. One of Shakespeare’s earliest works, the play follows two sets of twins, separated in infancy by a shipwreck, who are identical in face and name: each Dromio serves an Antipholus. When Antipholus (of Syracuse) sets out to find his brother in Ephesus, a madcap series of errors leads to mayhem in the city that cannot be stopped until a nun, a Duke, and an exorcist get involved. A wonderful opening to their 2018-19 season, Shakespeare Theatre Company’s innovative rendition of ‘The Comedy of Errors’ is not to be missed. Far from the stuffy preconceptions many hold about Shakespeare’s work, director Alan Paul has created a romp of pure fun in “The Comedy of Errors.” Scenes are punctuated by Michael Dansicker’s lively original songs, which make one wonder how the play could work without them. Unexpectedly spectacular are the tap dancing policemen, who charm the audience while singing about their love for their law enforcement. The twin pairs of Antipholuses and Dromios carry out much of the physical comedy of the play, their clever slapstick reminiscent of the Three Stooges. Gregory Wooddell is the charismatic Antipholus of Syracuse, a smooth, confident foil to Carson Elrod’s bumbling, hilarious Dromio. As their respective unsuspecting twins, Christian Conn and Carter Gill mirror their witty dynamic, expanding on their characters’ absurd nature. The four are at their best when they pair elaborately comedic blocking with Shakespeare’s text; when Dromio of Syracuse locks the Ephesians out of their own house, clever staging meets pure comedic prowess. The four twins are orbited by a rotating cast of larger-than-life personalities, all with their own struggles. The vain Adriana (Veanne Cox) fears that her Antipholus is cheating on her, while her younger sister, the earnest Luciana (Folami Williams), falls in love with the other Antipholus. Both Cox and Williams shine in their scenes, heightening their characters to maximize comedy. Eleasha Gamble, as the Courtesan, uses her velvety voice to exposit the show and even perform a raunchy burlesque number. In the vein of “A Funny Thing Happened on the Way to the Forum,” the cast is rounded out by a group of Proteans, who change characters depending on the situation. The three men easily become nuns, prostitutes, hairy-chested Greek waiters, and policemen, to the amusement of the audience. 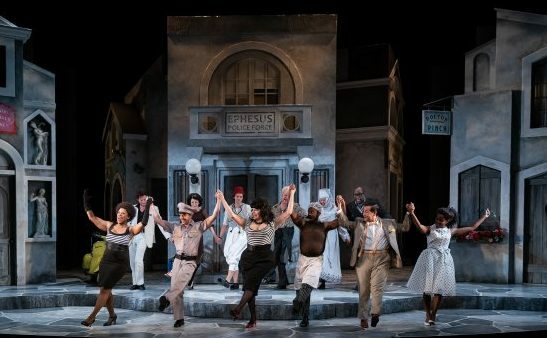 “The Comedy of Errors” takes place against a stylish backdrop of seemingly endless storefronts and houses, which rotate on an ingenious turntable to create the streets of Ephesus. Fittingly, characters dodge and weave among the alleyways, peering through windows and standing in doorways during scene changes. For all its comedic genius, at its heart, “The Comedy of Errors” is a story about the reunification of a family. A wonderful opening to their 2018-19 season, Shakespeare Theatre Company’s innovative rendition of “The Comedy of Errors” is not to be missed. Advisory: Strobe lights, herbal cigarettes. Recommended for ages 13 and up. “The Comedy of Errors” runs through October 28, 2018, at the Lansburgh Theatre: 450 7th St NW, Washington, DC. Tickets are available online here, or at (202)-547-1122.